Home » Home » Speaking Of Dogs . . . Speaking Of Dogs . . .
A few weeks ago I finally got up the energy to paint my hall bathroom. The color I used is called Icy Teal (WGN45) from the Glidden line at Walmart. Yes, Walmart. I was a little wary about buying paint at Walmart, just because it is mixed by the same guys who change your oil in your car (not kidding, at my Walmart they call the guys over from the auto department to mix it for you). I am in love with the paint though! It’s the Glidden Brilliance 2 in 1 Paint & Primer and it went on like butter! And it almost covered in 1 coat. Whenever I see them advertise 1 coat, I really just hope it will cover in 2 coats. But this stuff actually did not look bad after just one coat. I did put a second on for good measure. And the best part is that it was about $5 cheaper per gallon than the Home Depot paint. (You would think I am being compensated by Glidden or Walmart as much as I’m gushing over this paint, but I am not. They have no idea who the heck I am). Now, unfortunately this room is too small for me to take you on a real room tour or anything. From this photo, you can see that if you stand in the doorway the sink is to your immediate right. To the left and behind the bathroom door is the toilet area (sort of behind that black hanging fruit thingie) and right above the toilet is the shelf that I have been showing you. Sheba wanted to say Hi, BTW. Sheba was a good dog yesterday and did not play in the burr bushes, so she gets featured on the blog this morning. A certain other dog, who will remain nameless, wasn’t as good, so you won’t be seeing her or her mess of a hairdo today. Eeek! I almost forgot to show you the before shot. This is what the walls looked like before I painted. It was one of those sponge painting jobs from the 90’s that were so popular back then. Much like wallpaper, it may look good when it was on the wall, but it’s a bear to get off the wall. A lot of sanding went into making the wall smooth again. Who knew sponge painting was so bumpy? BTW, since we’re on a toilet themed post, here are the nautical prints that I showed you last Monday with their new gray paint job. They have a sort of driftwood look to them now. I put them over the toilet in our master bathroom (which you will never in a million years ever see on this blog because it is too ugly for words). So enough of the potty room tours around here. How was your weekend? Did you spend inordinate lengths of time pulling burrs out of dog fur? Is that shelf recessed in the wall, between the studs? I have been cogitating on ways to increase room in my teeny weeny bathroom and that occurred to me–recessed shelving. No burrs yet…but it will come…we get them in our summer grasses. We are working on finishing the moldings…it is the job that never ends. I keep thinking that when the magazine calls (wishful thinking here), we need to have it done! So keep pushing on! Love the color on the walls and I adore all the doggie stuff! Pam I really like that color!! Thanks for showing us your little bathroom! @Joanne – no it’s on top of the wall, not between the studs. That would be a good idea to put it between the studs though! What a fabulous color. Another great display. You really do put together the best vignettes. Nice bathroom makeover. Amazing how much paint can change things. 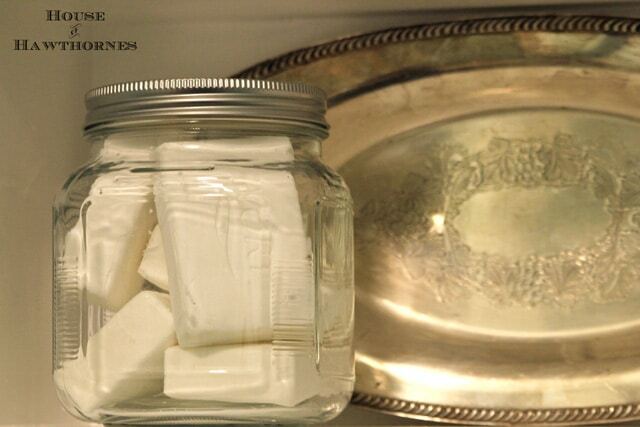 I did sponge painting at our last house in the formal dining room…early 90s. I’m sure it was a beast to get off the walls too. I bathed 50% of our dogs this weekend, but thankfully no burr pulling! Sheba is adorable, and looks quite pleased with herself. I’ve got my dogs on the blog today, too, but sadly no wonderful painting projects. Gorgeous color — we used a 2-in-1 paint — Behr from Home Depot — and hated it. I’m glad to hear the Glidden is better! Cute. I want that Springer head. We are having the little burr problem too. The paint looks great. I adore the dog pictures! Nice job! Ahh, yes sponge-painting. In another 25 years it will be retro-chic, right? Yes, burrs are a pain (literally!). I love the new paint color and how the sailing prints turned out, too! Looks beautiful! 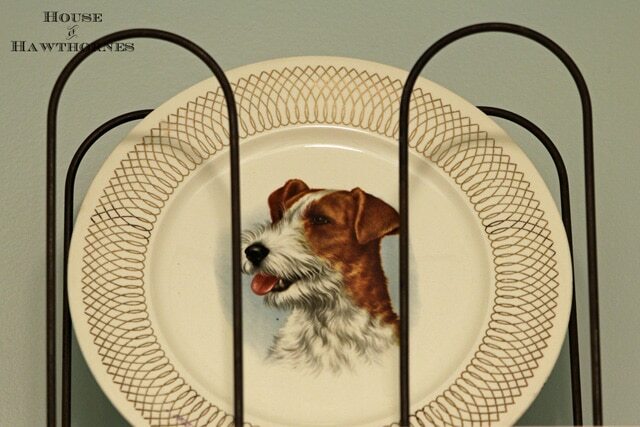 The terrier plate is after my heart…but Sheba is the real heart stealer! The color you picked is yummy! Much better then the sponge painting. Did you sand it all off by hand or did you use a electric something or another? 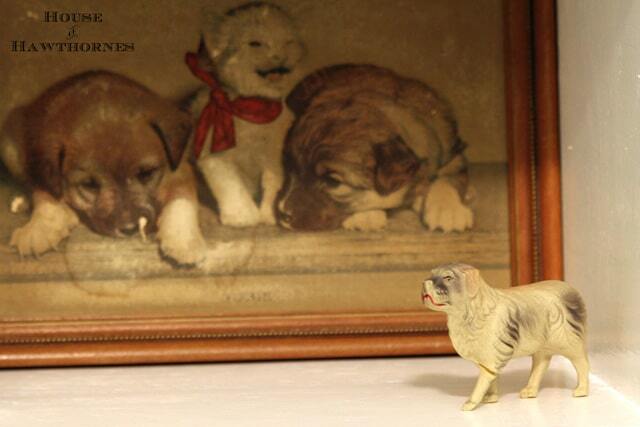 I have always loved your dog prints and figures. They look perfectly adorable dressing up the Loo. Love the paint color. It’s perfect with the white shelf. 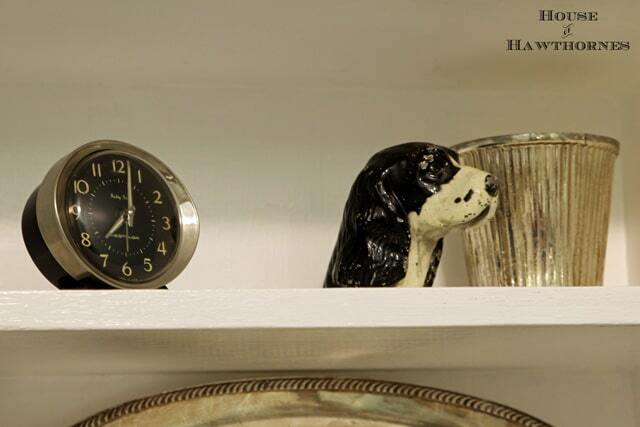 I love clocks and dog figurines too. 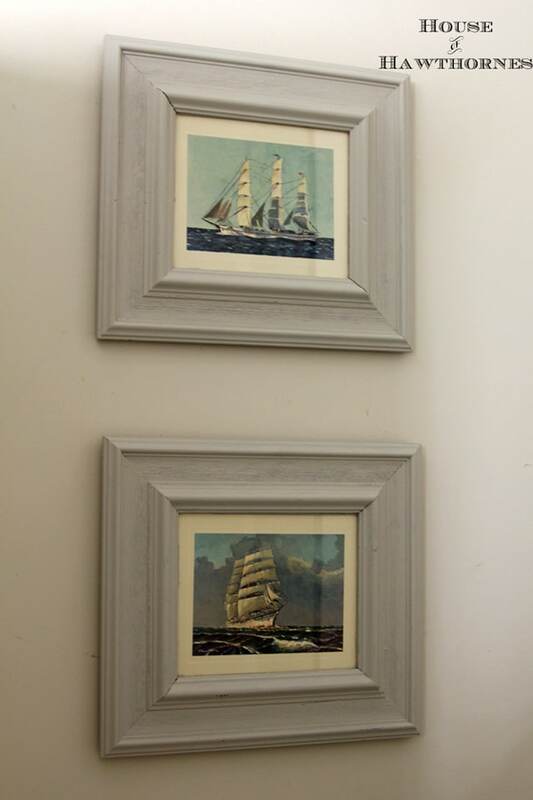 I wonder if the nautical prints will get featured with the newly painted frames too? I love the color, it’s so soft and restful. Of course, I love the dogs too!! Great color, but my favorite part is the dogs – not real and real too! Great display, and sweet looking puppy!! Sheba is sweet. Like the teal paint and the frames turned out awesome. Your paint color looks marvelous! I bought the paint and primer from Lowe’s (not cheap) and it took 3 coats of white to cover white primed walls. Next time I’ll go to Walmart. I love all the doggies, real and ceramic. And the prints have been magically transformed by painting the frames! As the proud owner of 2 (yes two!) Jack Russell Terriers, I have to say that this room is awesome! Love all the vintage dogs, especially that plate. Thanks for joining us at The Scoop! From what I could see, the bathroom looks beautiful! I love that color…it seems very calming. Believe me, you’ll never see my master bathroom on my blog either…I can barely even stand to look at it myself. Very nice paint color. 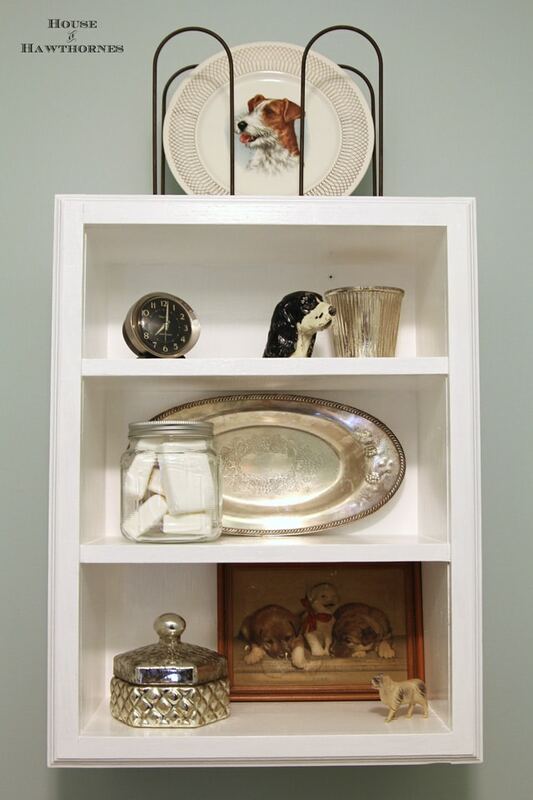 Your white shelf with dog vignettes looks great. I epecially liked the dog plate. I have that same print titled “Susie” with the puppies and kitty in my home. Some of our 80’s and 90’s paint/walpaper decor are hard to undo. A couple of years back we removed a wallpaper ceiling border. It sure went up way easier than it came down! I love the colour. Absolutely gorgeous. I’m trying to choose something similar for my hall bathroom and I’m feeling very inspired by this! I really love that color, I always shy from decorative painting because I know some day I’m going to want to get rid of it and thats where the tedious work comes in. 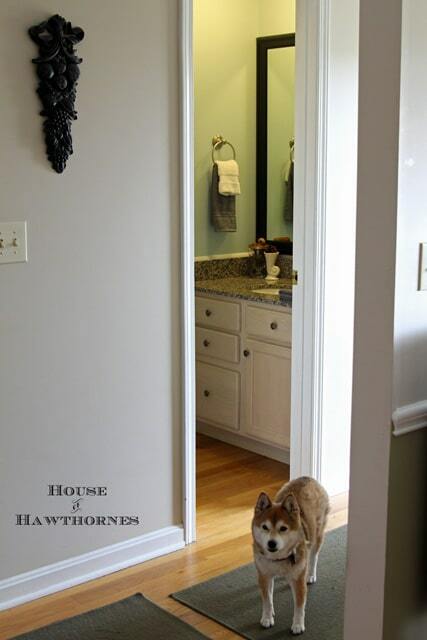 Your bath looks great and Sheba is super cute! I love the grey color. The nautical prints look wonderful too. We spent inordinate amounts of time outdoors this weekend and are tired, tired, tired. I am a huge fan of your puppy and also the inanimate puppies-so so cute. The Icy Teal color is really pretty, and I love your dog themed shelves, and the nautical prints. I know what you mean about not showing the master bath..I wouldn’t show mine, either. I love this! I want a dog themed room now! Those old sponged wall are a horror – I have had to cover a few of them in my time 🙁 Sheba is a doll. Hi Sheba! You’re a cutie-pie! 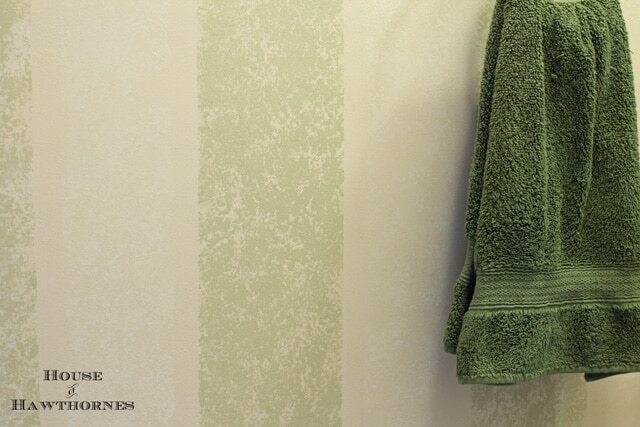 Love the color of your bathroom. Have never tried Walmart paint. Your wee bathroom is delightful!